There are few studies that provide estimates of hydraulic conductivity or permeability for the Cape Fear interval. Temples and Waddell (1996) reported permeabilities ranging from 1,000 to 6,000 millidarcys. 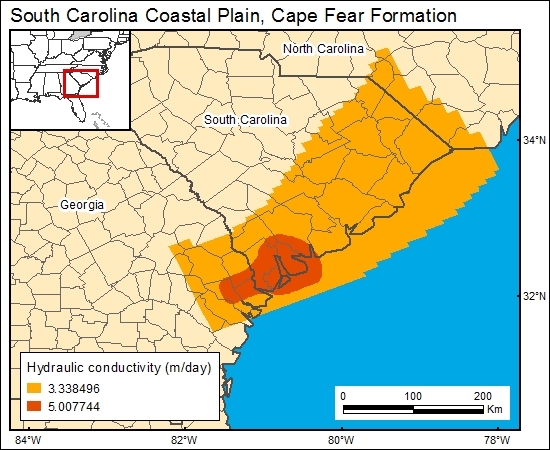 Aucott (1988), in his modeling studies of regional aquifers, presented a map showing spatial distribution of transmissivities in the Cape Fear interval. We used his transmissivity values. Recalling Hydraulic Conductivity = Transmissivity/Aquifer Thickness, we used the Cape Fear aquifer thickness GIS data layer to convert Aucott's (1988) transmissivity values to hydraulic conductivity.